Yesterday I had the day off and wouldn’t you know I got sick again. Why is it I only get leaning-over-the-toilet-wishing-I-were-dead ill when I have vacation time? The last time I was this sick was Christmas Day and the day after. I have no idea what happened. I never get sick like that and here we are less than three months later feeling just as miserable as before. Thankfully I had only eaten a breakfast sandwich on an English muffin and not an entire holiday spread. Made my job much easier this time. I do have a theory that perhaps Autumn is contributing to the frequency of my sickness. She’s a toddler and touches everything and I have to admit I’m not as vigilant about washing her hands as I should be. Add the other kids she hangs with at daycare into the mix and you’re looking at a whole mess of germs. Note to self; pick up more Purell. I was feeling much better last night after I begged Nathan to bring me home a ginormous Frosty from Wendy’s. I’m trying not to indulge like that anymore, but seeing as the one thing I ate during the day made a return trip I felt I deserved a treat. I was nearly recovered by the time I hit the sack last night, but I was mad about losing the day because I had plans to get so much done. Our couches are being delivered tomorrow and I needed to shampoo the carpet because the odor of dog pee smacks you in the face as soon as you walk in the room. I also needed to put the finishing touches on our fireplace. 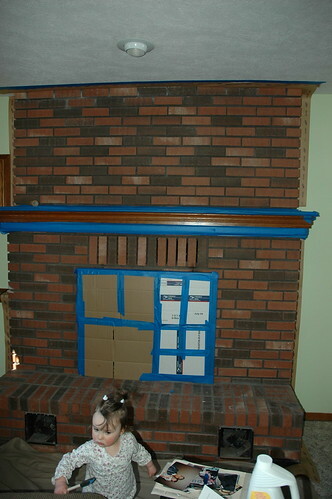 Nathan painted the fireplace last weekend. I was supposed to do it during my three days off this week, but I’m so glad he decided to do it when he did. It turned out better than I could have imagined. The website had all sorts of testimonials about how great this paint is, but I figured since we’re sloppy painters it would more or less come out looking like a Jackson Pollock experiment and not much more. I should have given Nathan more credit. I didn’t get a chance to take the picture before Nathan had everything taped off, but you can pretty much get the idea how it looked. The surly looking toddler at the bottom of the picture is holding a paintbrush but that is not fresh paint on it. We’re not that stupid. Is that not gorgeous? 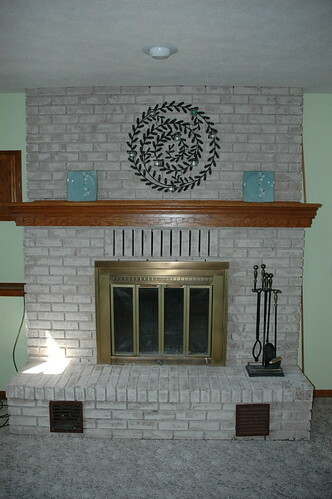 Nathan did a fantastic job and the color of the bricks compliments the new wall color so much better than the red did. My only complaint is that I hung that wreath off center. I’m not about to change it right now because hanging that thing involved drilling holes into the mortar and I think I’ve tapped into all the testosterone I’ve got right now. Besides, there will probably be only a handful of people who will see it anyway. Well, them and the internet. There will be more photos to come as the room gets put together. Have I mentioned that the couches arrive tomorrow? Yes? Well, I’m just really excited. I feel like such a grown up. It looks beautiful! He did a great job. Hope you feel better soon.